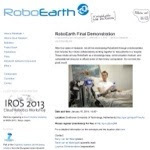 Did you hear about RoboEarth? It's like Wikipedia for robots. Wikipedia is used by a lot of people as information on which they base their thoughts, actions, and attitudes. It's a real-life example of people thinking that because it's on the Internet, it must be true. And, of course, that's bunk. Because I can put stuff on Wikipedia. Me! I mean, have you ever read the stuff I write? And Wikipedia will let me put stuff out there for other people to use. And I have put stuff on Wikipedia. And you can, too. And, some of you have. Pity the poor souls that don't know any better than to believe anything I write. Or that some of y'all write. Anyway, now the robots got their own Wikipedia. And that's a scary thing. What if some robot edits an entry on humans saying that robots are supposed to kill all humans? Okay, I admit that there could be a benefit if some humans left the gene pool, but all humans. 100% of humanity wiped out? I'm not in favor of that. That's probably about 20% too many. Pity the poor souls that don’t know any better than to believe anything I write. And just why should we believe that? In the little diagram on the What is RoboEarth page, they label the client robots as 'HAL'. Ominous, to say the least! Danger Will Robinson, Wikipedia approaching! "What if some robot edits an entry on humans saying that robots are supposed to kill all humans?" UGH!! !YOU WINGNUTS ARE SO DUMB!!!! !I MEAN WHO WRITES THE ENCYCLOPEDIAS???HUH?? ?OR DICTIONARIES?? ?PEOPLE DO THATS WHO!! !AND A CONSENSUS OF PEOPLE AGREED THAT IT WAS CORRECT!! !SO THATS WIKIPEDIA YOU DUMMIES!!!DUH!!!URRRGH!! !SO CLUELESS!!!UGH!!!UGH!! !YEAH YOU CAN PUT YOUR DUMB WINGNUTTERY INTO WIKIPEDIA BUT PEOPLE AT WIKIPEDIA WILL CORRECT YOUR IDIOCY AND MAKE IT CORRECT ACCORDING TO A GREATER CONSENSUS OF CLEAR THINKING PROGRESSIVE PEOPLE WHO ARENT TRAPPED IN A FOG OF RESCUMLICAN HILLBILLY BACKWOODS STUPIDITY!!!GEEZE!! !SO TOTALLY IGNORANT!!! I love Wikipedia. It's a great place to look up answers to "curiosity questions." As long as I find an answer, who cares if it's right or wrong. @6 - I agree. I use Wikipedia for a broad conceptual overview if I have ZERO knowledge on a topic. I'd never bet my paycheck on the accuracy of the details, especially if the topic is even vaguely political. What if they misinterpret the entry for the movie titled "Destory all humans"?